I know what you are thinking..."That is the worst name." Italian Burrito. It doesn't sound, exactly, fancy. I spent some time (about 3 minutes) pondering the best name for this. Then, I stopped spending time pondering the name and ended up with Italian Burrito. The only reason that I am fretting is...this is one of my favorite things I have had in a while. And the name definitely belittles how amazing this is. Let me paint you a picture (©mametown). This is a wrap filled with Israeli couscous (i.e. pasta), sautéed eggplant, garlicky kale, roasted bell peppers, topped with a little shredded mozzarella cheese, marinara sauce, and grated parmesan. It you want a meal that is healthy but also not really, this is the meal for you. Warning. I made the marinara from tomatoes I grew and roasted the peppers from our CSA. I have been shoveling so many raw tomatoes in my face over the course of the summer that I am now forced to cook them. The eggplant and kale came in our CSA this week too. So did the garlic. Scot has a saying that I don't think I have shared yet on foodforscot. If something is really good, he says it is a "knock out home run." He says that but not as a joke. He has said it long before he became a dad, but now all the pieces are starting to fit together. Ok, well, he actually didn't call this dish a knock out, home run. But that is because I ruined it. I made this one night that Scot was working late. I made it and ate it after baby bed time. And THEN Scot came home and I made him one. I always try to let Scot form his own opinion on a meal before giving him my opinion because he is a people pleaser and heavily influenced by my superb taste buds. This time, though, I was scarfing it down when he walked in and I said something like, "OMG, this is the best thing ever." In other words, knock out home run. Prepare all the separate burrito fillings. First, slice the eggplant and lay out in a single layer on a kitchen towel. Sprinkle each slice with salt and let sit for 15 minutes or longer. Turn each slice over and salt the other side. Let sit for 15 minutes or longer, on the new side. Once the eggplant slices have released some water, use another kitchen towel to pat dry and wipe excess salt off. In the meantime, combine the couscous with 2 cups of water and a dash of salt in a small saucepan. Bring to boil, remove lid, and let simmer until all the water has evaporated and couscous is tender. Remove from heat and set aside. Dice eggplant into cubes and sauté in olive oil in a skillet over medium high heat. Cook for about 10 minutes, tossing occasionally. Remove from heat and set aside. In the same pan over medium high heat, add some olive oil and the kale. Sauté for a few minutes until the kale has slightly wilted. Add the garlic and cook, stirring often, until the kale reaches desired cooked down-ness. Assemble the burrito. 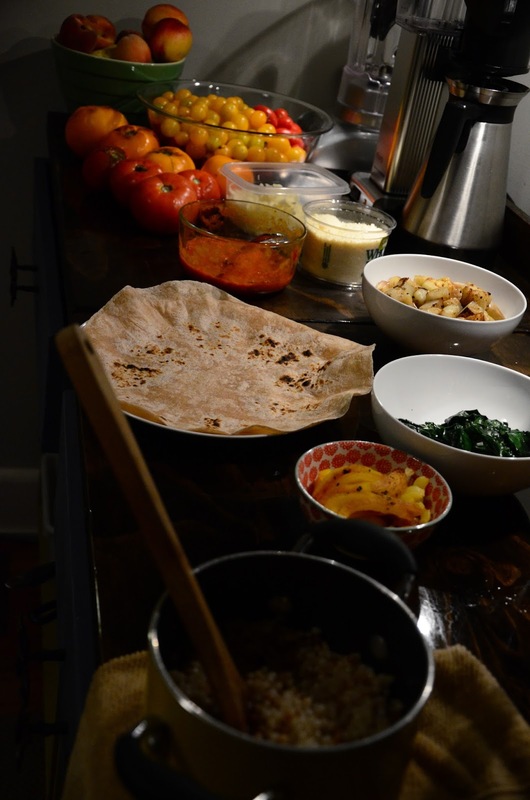 Warm the tortilla over a gas burner, in the microwave, or in the oven so that is pliable. Top with couscous, kale, eggplant, and roasted peppers. Sprinkle some mozzarella cheese, spoon on some marinara, and sprinkle with parmesan. Wrap it up burrito style.